(Francisco Kjolseth | The Salt Lake Tribune) America's Freedom Festival Parade, in Provo, is finally letting freedom ring. For the first time, it is allowing three LGBTQ groups to participate in this year's July 4 event, including Mormon's Building Bridges. (Francisco Kjolseth | The Salt Lake Tribune) Thousands line the streets as they take in the floats and character that makes up Utah County during the America’s Freedom Festival Grand Parade on Wed. July 4, 2018, in Provo. 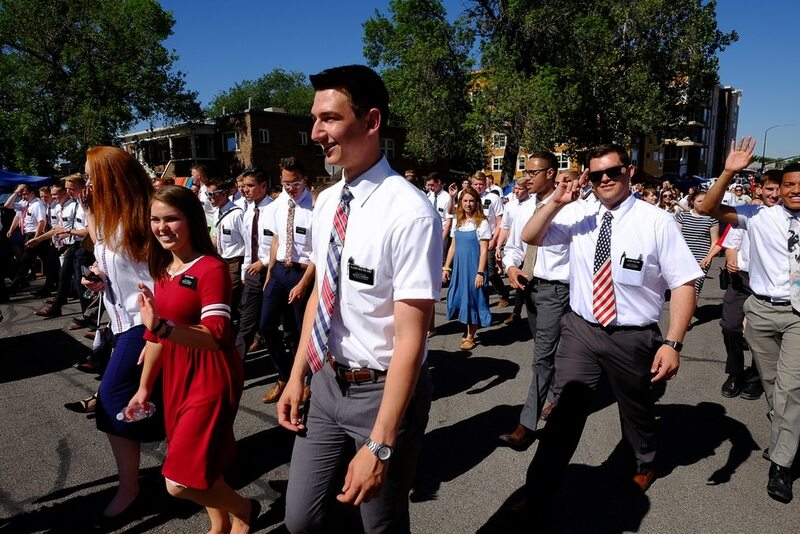 (Francisco Kjolseth | The Salt Lake Tribune) Mormon missionaries are cheered by the crowds lining the streets for AmericaÕs Freedom Festival Grand Parade on Wed. July 4, 2018, in Provo. 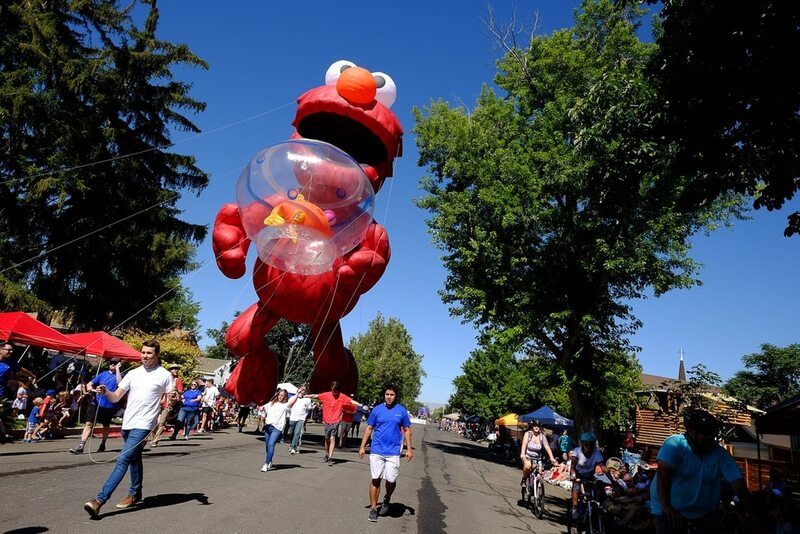 (Francisco Kjolseth | The Salt Lake Tribune) America's Freedom Festival Parade, in Provo, is finally letting freedom ring. For the first time, it is allowing three LGBTQ groups to participate in this year's July 4 event, including Mormon's Building Bridges. (Francisco Kjolseth | The Salt Lake Tribune) Kent Carollo is all smiles as America's Freedom Festival Parade, in Provo, is finally letting freedom ring on Wed. July 4, 2018. For the first time, it is allowing three LGBTQ groups to participate in this year's July 4 event, as Encircle: LGBT+ Family & Youth Resource Center who joined the parade. (Francisco Kjolseth | The Salt Lake Tribune) Thousands line the streets as they take in the floats and character that makes up Utah County during the America’s Freedom Festival Grand Parade on Wed. July 4, 2018, in Provo. (Francisco Kjolseth | The Salt Lake Tribune) America's Freedom Festival Parade, in Provo, is finally letting freedom ring on Wed. July 4, 2018. For the first time, it is allowing three LGBTQ groups to participate in this year's July 4 event, including PFLAG, Parents, Families & Friends of Lesbians And Gays who prepared a quilt for the event. (Francisco Kjolseth | The Salt Lake Tribune) America's Freedom Festival Parade, in Provo, is finally letting freedom ring on Wed. July 4, 2018. For the first time, it is allowing three LGBTQ groups to participate in this year's July 4 event, including PFLAG, Parents, Families & Friends of Lesbians And Gays who prepared a quilt for the event. (Francisco Kjolseth | The Salt Lake Tribune) Savannah, 14, left, who came out to her Mormon church at the age of 12, joins Miriam Ponczoch, 6, as America's Freedom Festival Parade, in Provo, is finally letting freedom ring on Wed. July 4, 2018. For the first time, it is allowing three LGBTQ groups to participate in this year's July 4 event, as Encircle: LGBT+ Family & Youth Resource Center who joined the parade. (Francisco Kjolseth | The Salt Lake Tribune) America's Freedom Festival Parade, in Provo, is finally letting freedom ring on Wed. July 4, 2018. For the first time, it is allowing three LGBTQ groups to participate in this year's July 4 event, as Encircle: LGBT+ Family & Youth Resource Center joins the parade. (Francisco Kjolseth | The Salt Lake Tribune) Tyler Domgaard, center, and Jamie Knox celebrate with parade goers as America's Freedom Festival Parade, in Provo, is finally letting freedom ring on Wed. July 4, 2018. For the first time, it is allowing three LGBTQ groups to participate in this year's July 4 event, including Encircle: LGBT+ Family & Youth Resource Center who joined the parade. (Francisco Kjolseth | The Salt Lake Tribune) Garret Hjorth joins other ground clews inflating hot air ballonÕs on Bulldog Field in Provo during the AmericaÕs Freedom Festival Balloon Fest on Wed. July 4, 2018. Crowds gathered to watch approximately 26 balloons before launching into the air during the dawn hours before the parade. (Francisco Kjolseth | The Salt Lake Tribune) Rep. Curt Bramble, R-Provo, joins other ground clews inflating hot air ballonÕs on Bulldog Field in Provo during the AmericaÕs Freedom Festival Balloon Fest on Wed. July 4, 2018. Crowds gathered to watch approximately 26 balloons before launching into the air during the dawn hours before the parade. (Francisco Kjolseth | The Salt Lake Tribune) Miriam Ponczoch, 6, is joined by her father Joseph as America's Freedom Festival Parade, in Provo, is finally letting freedom ring on Wed. July 4, 2018. For the first time, it is allowing three LGBTQ groups to participate in this year's July 4 event, as Encircle: LGBT+ Family & Youth Resource Center who joined the parade. (Francisco Kjolseth | The Salt Lake Tribune) Thousands line the streets as they take in the floats and character that makes up Utah County during the America’s Freedom Festival Grand Parade on Wed. July 4, 2018, in Provo. (Francisco Kjolseth | The Salt Lake Tribune) Bruce Dodson communicates with his team while joined by Braxton Giles, 11, as they sport similar stripes while ground clews inflate hot air ballonÕs on Bulldog Field in Provo during the AmericaÕs Freedom Festival Balloon Fest on Wed. July 4, 2018. Crowds gathered to watch approximately 26 balloons before launching into the air during the dawn hours before the parade. (Francisco Kjolseth | The Salt Lake Tribune) America's Freedom Festival Parade, in Provo, is finally letting freedom ring on Wed. July 4, 2018. For the first time, it is allowing three LGBTQ groups to participate in this year's July 4 event, as Encircle: LGBT+ Family & Youth Resource Center joins the parade. (Francisco Kjolseth | The Salt Lake Tribune) Members from another galaxy take in the primitive forms of flight as ground clews inflate hot air ballonÕs on Bulldog Field in Provo during the AmericaÕs Freedom Festival Balloon Fest on Wed. July 4, 2018. (Francisco Kjolseth | The Salt Lake Tribune) America's Freedom Festival Parade, in Provo, is finally letting freedom ring on Wed. July 4, 2018. For the first time, it is allowing three LGBTQ groups to participate in this year's July 4 event, as Encircle: LGBT+ Family & Youth Resource Center joins the parade. (Francisco Kjolseth | The Salt Lake Tribune) America's Freedom Festival Parade, in Provo, is finally letting freedom ring on Wed. July 4, 2018. For the first time, it is allowing three LGBTQ groups to participate in this year's July 4 event, as Arturo Fuentes, left, and Eliza Crofts join the group Encircle: LGBT+ Family & Youth Resource Center during the parade. (Francisco Kjolseth | The Salt Lake Tribune) Thousands line the streets as they take in the floats and character that makes up Utah County during the America’s Freedom Festival Grand Parade on Wed. July 4, 2018, in Provo. (Francisco Kjolseth | The Salt Lake Tribune) Thousands line the streets to watch the floats and character that makes up Utah County during the AmericaÕs Freedom Festival Grand Parade on Wed. July 4, 2018, in Provo. (Francisco Kjolseth | The Salt Lake Tribune) America's Freedom Festival Parade, in Provo, is finally letting freedom ring on Wed. July 4, 2018. For the first time, it is allowing three LGBTQ groups to participate in this year's July 4 event, as Encircle: LGBT+ Family & Youth Resource Center who joined the parade. (Francisco Kjolseth | The Salt Lake Tribune) Thousands line the streets as they take in the floats and character that makes up Utah County during the America’s Freedom Festival Grand Parade on Wed. July 4, 2018, in Provo. (Francisco Kjolseth | The Salt Lake Tribune) Jim Zocchi waves to the crowds lining the streets for AmericaÕs Freedom Festival Grand Parade on Wed. July 4, 2018, in Provo. (Francisco Kjolseth | The Salt Lake Tribune) The American Fork High school band entertains the crowds lining the streets as they take in the floats and character that makes up Utah County during the AmericaÕs Freedom Festival Grand Parade on Wed. July 4, 2018, in Provo. (Francisco Kjolseth | The Salt Lake Tribune) Hot air balloons rise above Bulldog Field in Provo during the AmericaÕs Freedom Festival Balloon Fest on Wed. July 4, 2018. Crowds gathered at dawn to watch approximately 26 balloons that once aloft, participated in a hare and hound competition, where the ÒhoundÓ balloons try to drop beanbags onto a target laid out by the ÒhareÓ below. (Francisco Kjolseth | The Salt Lake Tribune) James Shuman is joined by his Spencer, 10, as they join the crowds lining the streets as they take in the floats and character that makes up Utah County during the AmericaÕs Freedom Festival Grand Parade on Wed. July 4, 2018, in Provo. (Francisco Kjolseth | The Salt Lake Tribune) Ground clews inflate hot air ballonÕs on Bulldog Field in Provo during the AmericaÕs Freedom Festival Balloon Fest on Wed. July 4, 2018. Crowds gathered to watch approximately 26 balloons before launching into the air during the dawn hours before the parade. (Francisco Kjolseth | The Salt Lake Tribune) Thousands line the streets as they take in the floats and character that makes up Utah County during the America’s Freedom Festival Grand Parade on Wed. July 4, 2018, in Provo. (Francisco Kjolseth | The Salt Lake Tribune) Ground clews inflate hot air ballonÕs on Bulldog Field in Provo during the AmericaÕs Freedom Festival Balloon Fest on Wed. July 4, 2018. Crowds gathered to watch approximately 26 balloons before launching into the air during the dawn hours before the parade. (Francisco Kjolseth | The Salt Lake Tribune) Josh Holt, who was released from a Venezuelan prison earlier this year after being held for nearly two years, is joined by his wife Thamara as they join AmericaÕs Freedom Festival Grand Parade on Wed. July 4, 2018, in Provo. (Francisco Kjolseth | The Salt Lake Tribune) WWII era planes streak the sky as thousands line the streets as they take in the floats and character that makes up Utah County during the AmericaÕs Freedom Festival Grand Parade on Wed. July 4, 2018, in Provo. (Francisco Kjolseth | The Salt Lake Tribune) Rep. Curt Bramble, R-Provo, joins other ground clews inflating hot air ballonÕs on Bulldog Field in Provo during the AmericaÕs Freedom Festival Balloon Fest on Wed. July 4, 2018. Crowds gathered to watch approximately 26 balloons before launching into the air during the dawn hours before the parade. (Francisco Kjolseth | The Salt Lake Tribune) America's Freedom Festival Parade, in Provo, is finally letting freedom ring on Wed. July 4, 2018. For the first time, it is allowing three LGBTQ groups to participate in this year's July 4 event, as Jamie Knox joins the group Encircle: LGBT+ Family & Youth Resource Center during the parade. (Francisco Kjolseth | The Salt Lake Tribune) Thousands line the streets as they take in the floats and character that makes up Utah County during the America’s Freedom Festival Grand Parade on Wed. July 4, 2018, in Provo. (Francisco Kjolseth | The Salt Lake Tribune) Rep. John Curtis and his family waves to parade goers lining the streets taking in the floats and character that makes up Utah County during the AmericaÕs Freedom Festival Grand Parade on Wed. July 4, 2018, in Provo. (Francisco Kjolseth | The Salt Lake Tribune) Danielle smith holds her son Nathan, 3, as they join thousands lining the streets to take in the floats and character that makes up Utah County during the AmericaÕs Freedom Festival Grand Parade on Wed. July 4, 2018, in Provo. (Francisco Kjolseth | The Salt Lake Tribune) Ground clews inflate hot air ballonÕs on Bulldog Field in Provo during the AmericaÕs Freedom Festival Balloon Fest on Wed. July 4, 2018. Crowds gathered to watch approximately 26 balloons before launching into the air during the dawn hours before the parade. (Francisco Kjolseth | The Salt Lake Tribune) Thousands line the streets as they take in the floats and character that makes up Utah County during the America’s Freedom Festival Grand Parade on Wed. July 4, 2018, in Provo. (Francisco Kjolseth | The Salt Lake Tribune) The BYU dunk squad entertains the crowds for AmericaÕs Freedom Festival Grand Parade on Wed. July 4, 2018, in Provo. (Francisco Kjolseth | The Salt Lake Tribune) Utah Governor Gary Herbert waves to parade goers lining the streets taking in the floats and character that makes up Utah County during the AmericaÕs Freedom Festival Grand Parade on Wed. July 4, 2018, in Provo. (Francisco Kjolseth | The Salt Lake Tribune) Joined by the moon, hot air balloons rise above Bulldog Field in Provo during the AmericaÕs Freedom Festival Balloon Fest on Wed. July 4, 2018. Crowds gathered at dawn to watch approximately 26 balloons take to the sky. (Francisco Kjolseth | The Salt Lake Tribune) Ground clews inflate hot air ballonÕs on Bulldog Field in Provo during the AmericaÕs Freedom Festival Balloon Fest on Wed. July 4, 2018. Crowds gathered to watch approximately 26 balloons before launching into the air during the dawn hours before the parade. (Francisco Kjolseth | The Salt Lake Tribune) Balloons with businesses and individuals showing their support for Encircle: LGBT+ Family & Youth Resource Center in Provo join the pre-parade as thousands line the streets for AmericaÕs Freedom Festival Grand Parade on Wed. July 4, 2018, in Provo. (Francisco Kjolseth | The Salt Lake Tribune) Lt. Governor Spencer Cox waves to parade goers lining the streets taking in the floats and character that makes up Utah County during the AmericaÕs Freedom Festival Grand Parade on Wed. July 4, 2018, in Provo. (Francisco Kjolseth | The Salt Lake Tribune) WWII era planes streak the sky as thousands line the streets as they take in the floats and character that makes up Utah County during the AmericaÕs Freedom Festival Grand Parade on Wed. July 4, 2018, in Provo. (Francisco Kjolseth | The Salt Lake Tribune) Provo Mayor Michelle Kaufusi, who issued an open letter to residents to be respectful of LGBT groups in this years parade following the recent divide in their participation, waves to the crowds gathered for America’s Freedom Festival Grand Parade on Wed. July 4, 2018, in Provo. Provo • One of Utah’s most conservative cities made history Wednesday when it allowed, for the first time, LGBTQ groups to participate in its annual July Fourth parade. Residents who lined Provo’s University Avenue for the parade clapped and cheered as the LGBTQ groups passed, garnering as much excitement as the beauty queens, marching bands and horses. The loudest applause, though, was reserved for the group of Mormon missionaries — clad in white shirts and dark pants — that walked the parade route. In years past, support groups for gay, lesbian, bisexual and transgender people had applied — but been denied — participation in the America’s Freedom Festival Parade. Organizers claimed they were “activist groups” and did not meet the criteria for participation. It happened again this year, when five LGBTQ applications were denied. But the move generated criticism from residents and accusations that festival organizers had breached nondiscrimination clauses in its contracts with Provo City and Utah County. Representatives of Utah’s LGBTQ community met with festival organizers in an intense two-hour meeting that ultimately resulted in a compromise. “I hope it’s the start of a new chapter,” said Stephenie Larsen, the founder and CEO of Encircle, a resource center for LGBTQ youth, as they prepared to walk in the entertainment or “pre-parade” section of the event. More than 100 youths — along with many parents, siblings and friends — carried red, white and blue balloons while “I’ll Walk With You” played over a stereo speaker. While making history is nice, several of the Encircle teens said they are more excited to be themselves at a community event. Maddie Knowlton, who used the parade “to come out” to friends, believes that youths watching along the parade route “who haven’t come out yet” would be encouraged by the presence of the LGBTQ groups. And maybe, she said, it would give them courage to get help if they are lonely or suicidal. Provo Pride and PFLAG participated in Freedom Festival’s “grand parade,” carrying a quilt made from dozens of 12-by-12-inch squares. In order for Mormons Building Bridges to participate in the main parade, it agreed to build a float. The nonprofit is still gathering donations through crowdfunding to pay the $5,000 costs, said co-founder Erika Munson. 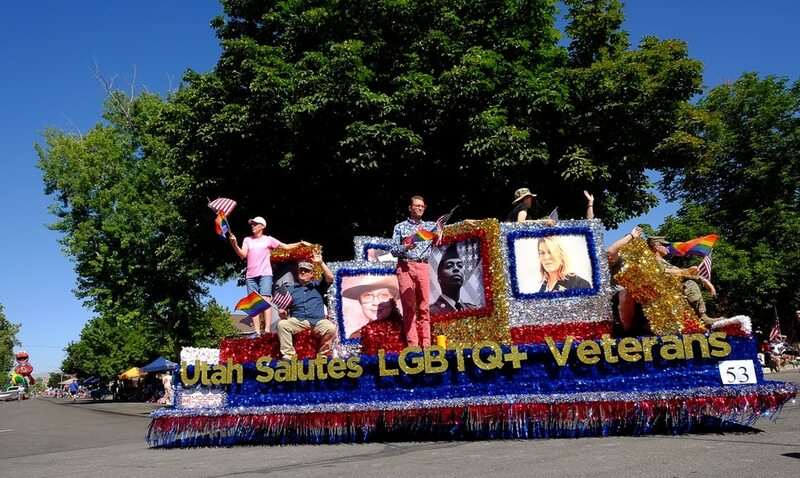 The float, titled “Utah Salutes Our LGBTQ Veterans: United We Stand,” honored LGBTQ soldiers, many of whom served when they were prohibited from being open about their sexuality. While many people believe the LGBTQ groups were making “too big of a deal” about parade participation, it sends an important signal, Munson added.